Berlin, 14 September 2017 – HomeToGo, the world’s largest metasearch for vacation rentals, cooperates with NextPax, the leading channel manager platform for the vacation rental and special lodging industry, in order to provide customers an even larger variety of vacation rentals to choose from. Also, property owners working together with NextPax will have the option to increase their reach by being displayed in the results of HomeToGo. Founded in 2006 by Erik Engel, NextPax provides property owners, managers and agents a platform to offer, book and update properties. Their network consists of more than 500,000+ accommodations that are being distributed via all large OTAs and numerous niche channels. Partnering with HomeToGo, a meta search engine with more than 10 million objects worldwide, NextPax increases their clients‘ reach and exposure. Simultaneously, HomeToGo strengthens their position as world leaders in the vacation rental market by adding new objects to their portfolio. Thus, HomeToGo expands opportunities for NextPax as well as their own. Founded only three years ago by Patrick Andrae, Nils Regge and Wolfgang Heigl, HomeToGo offers their users a sleek, user-friendly interface that makes it easy to find a suitable accommodation by comparing different offers. Numerous filters help users making a quick and thorough choice between a large number of rentals from leading global holiday letting websites. Headquartered in Berlin, HomeToGo continues to grow and expand their business: The company currently employs more than 100 employees and operates local sites in twelve different European countries. In 2016, a Russian metasearch was launched, in 2017 HomeToGo entered the Australian and the Mexican market. Furthermore, free mobile apps for iOS and Android have been launched this year. The integration of NextPax in the HomeToGo search engine will increase the chances for users to find the vacation home they are looking for. 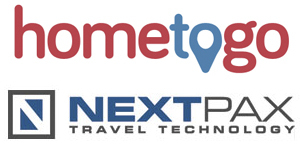 Meanwhile, NextPax widens their reach by adding HomeToGo as a new channel to their portfolio. HomeToGo is an independent holiday rental metasearch engine that allows you to quickly and easily search and compare listings from over 10 million offers in over 200 countries from more than 250 providers. With features such as smart filtering, users can find their ideal holiday rental by sorting according to their preferred destination, travel dates, budget and amenities. Headquartered in Berlin, the founding trio comprises of Patrick Andrä, Wolfgang Heigl and Nils Regge. The company currently employs more than 80 employees and operates local sites in twelve European countries, Russia, Mexico, Australia and the US. Founded in 2006, NextPax develops real time connections between booking channels and the inventory of tour operators and property managers. The extensive network of NextPax consists of 500,000+ accommodations and is continuously growing by connecting new professional property managers to the network. The cutting edge and highly automated vacation rental distribution technology provided by NextPax, allows accommodations to be distributed via all available large OTAs and numerous niche channels.